I’m not sure which I like more: giving a handmade gift or receiving one. 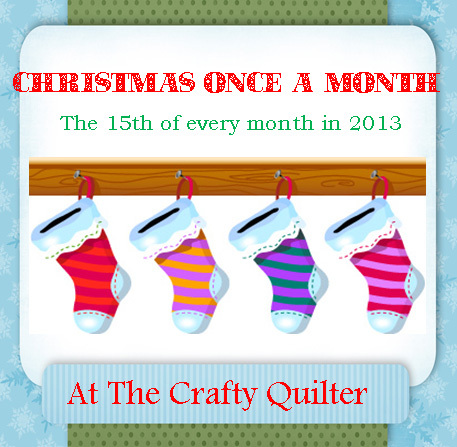 This month we’re going to tackle some gift making that will make your Christmas list a little shorter and a lot happier! 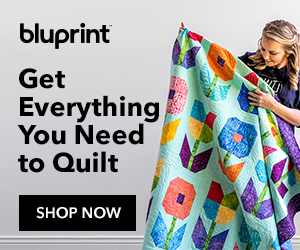 I have several quick and easy gifts to share with you that are perfect for the young child, the teenager or the adult on your list. I’m sure you’ve all made a pillow case before and if you’re one of my kids, you have at least two or three made by yours truly! 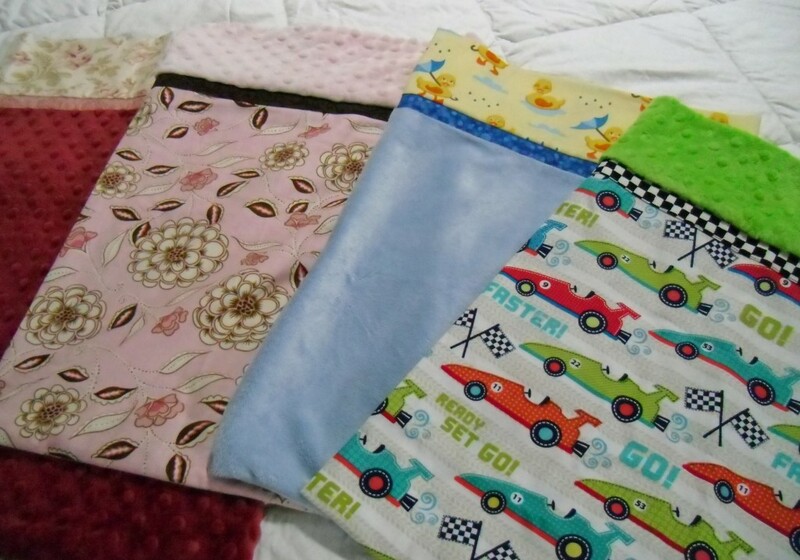 But a travel pillow case with Cuddle (Minkee) fabric is super soft, a bit more novel and it’s perfect for road trips, sleep overs and camping. And a simple book bag is always nice to take on the go as well. 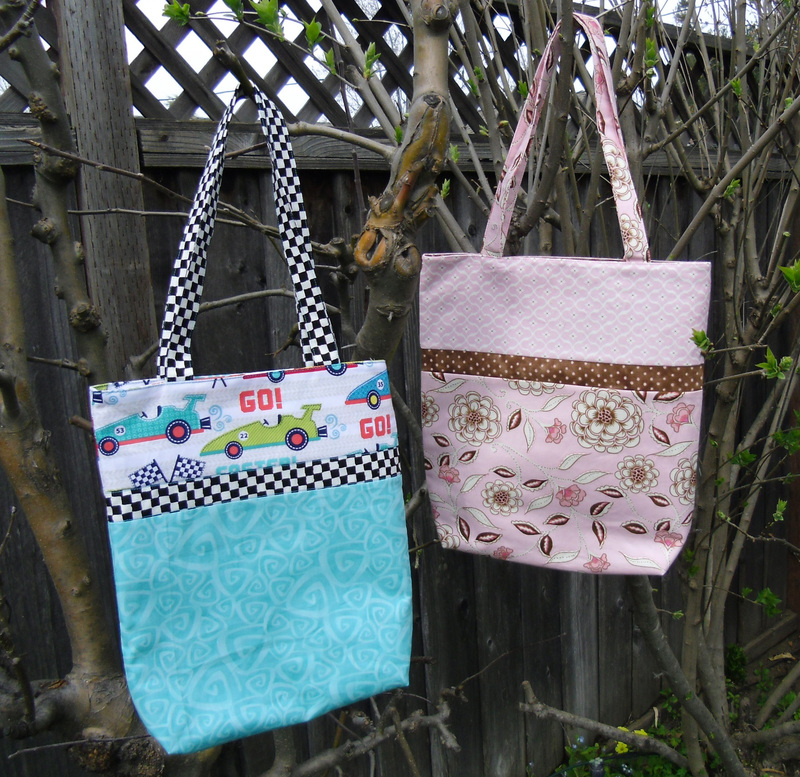 If you’ve never made a bag before, this will be an easy introduction for you. 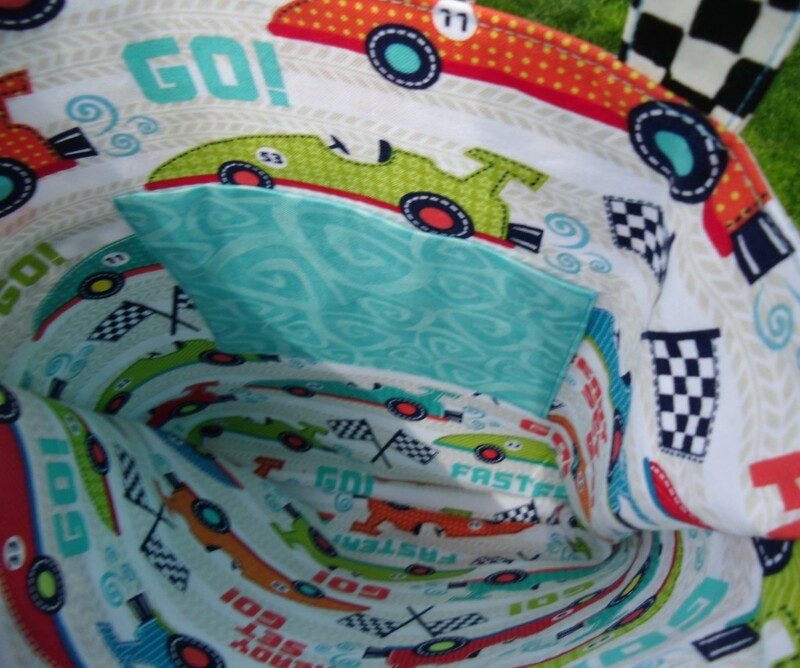 It can have one or two pockets on the inside and it’s reversible! 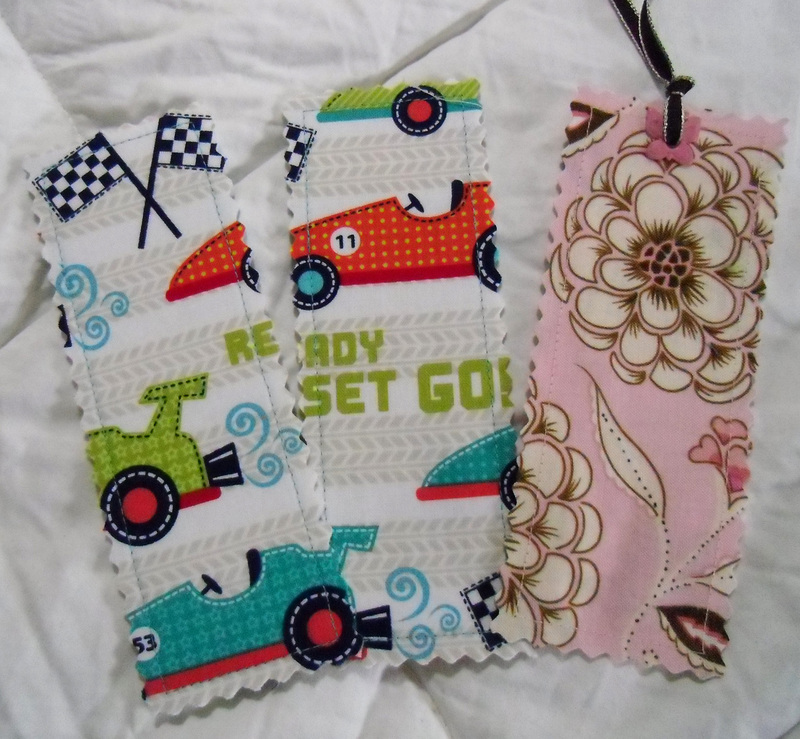 And why not go all out and make some bookmarks to go with the cute book bag. It’s a great way to use up scraps and they are sew easy, it will be hard to make just one! 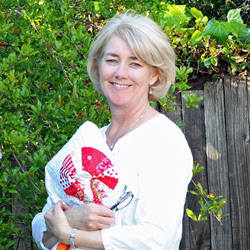 I found two sizes for a travel pillow: 12″ x 16″ OR 14″ x 20″. I was working with the smaller size, 12″ x 16″ since that’s what I had. The pdf gives instructions for both sizes. A great place to shop online for pillows is Pillow Cubes. They have many sizes available and lots of filling options, too. I used the “hot dog” style of making a pillow case and it’s my favorite way to make them. It only requires TWO seams and I can usually make one in less than an hour. 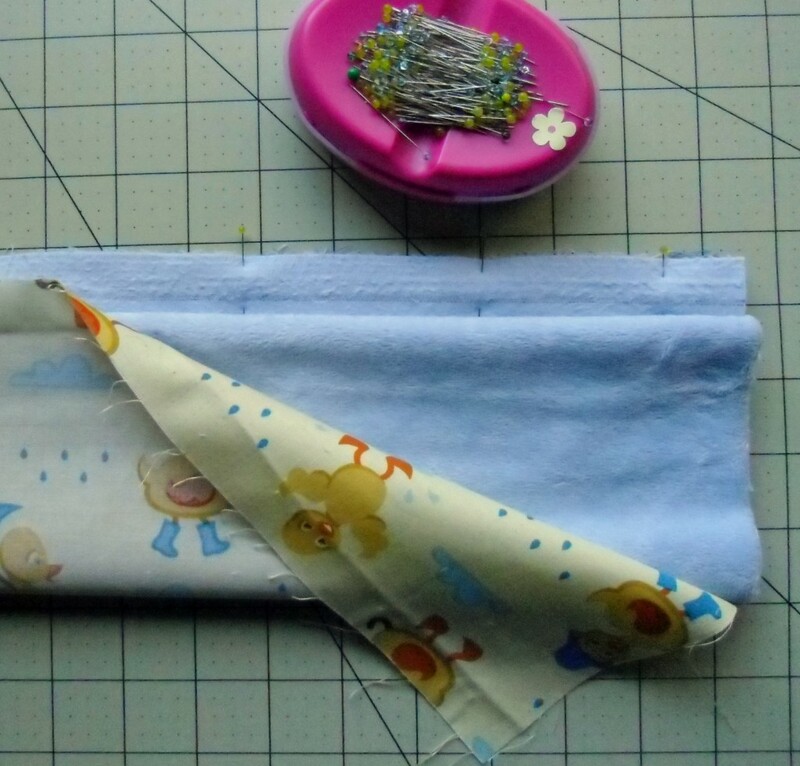 Also, I have customized the instructions for working with Cuddle or Minkee fabrics. They include 1/2″ seam allowance rather than 1/4″ and you’ll need a walking foot. When I make most of my pillow cases I use a “french seam” to enclose the seam allowances, but this is not possible or necessary if you’re using Cuddle fabric because it’s too thick and it doesn’t fray anyway. 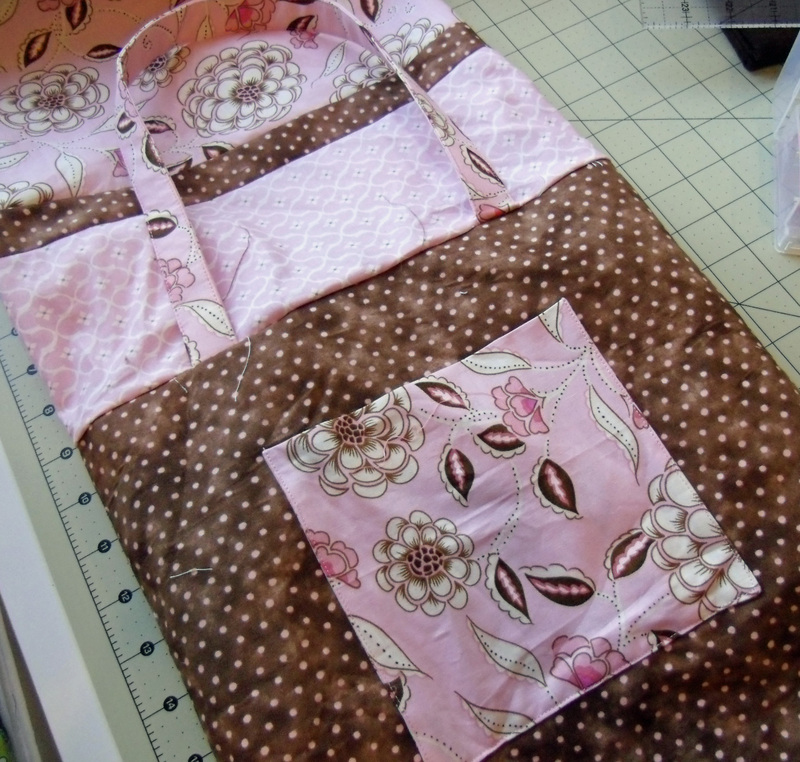 If you’re not using Cuddle or Minkee and you want to add french seams, then you should add 1/2″ to the width of all cut pieces. You can see a little crushed section near the accent strip. The Book Bag. 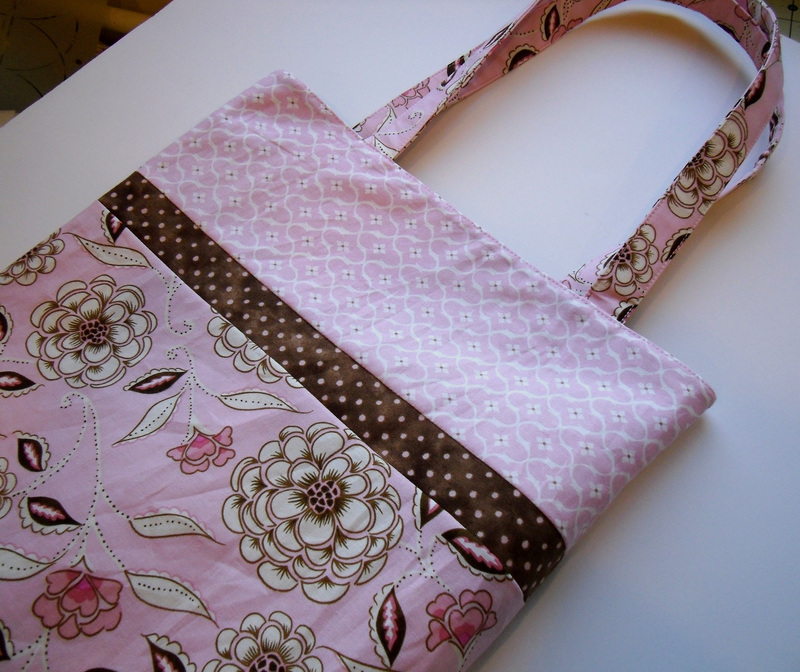 The finished size of this bag is 12″ wide x 14″ tall and 2″ deep. I made two versions of this and there was a little trial and error along the way. I don’t consider myself an expert bag maker, but I have read up on it and I’ve made a good many of my own. Recently, I found a great source of information at Geta’s Quilting Studio on the many different interfacings used to make bags. 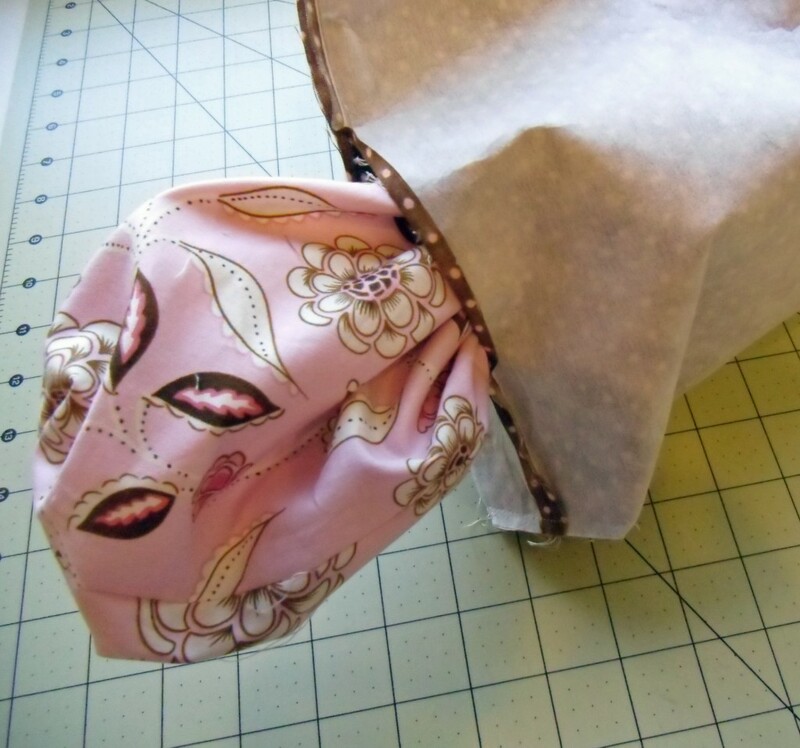 Her Interfacing Guide for Bags is a must-read if you want to learn more. 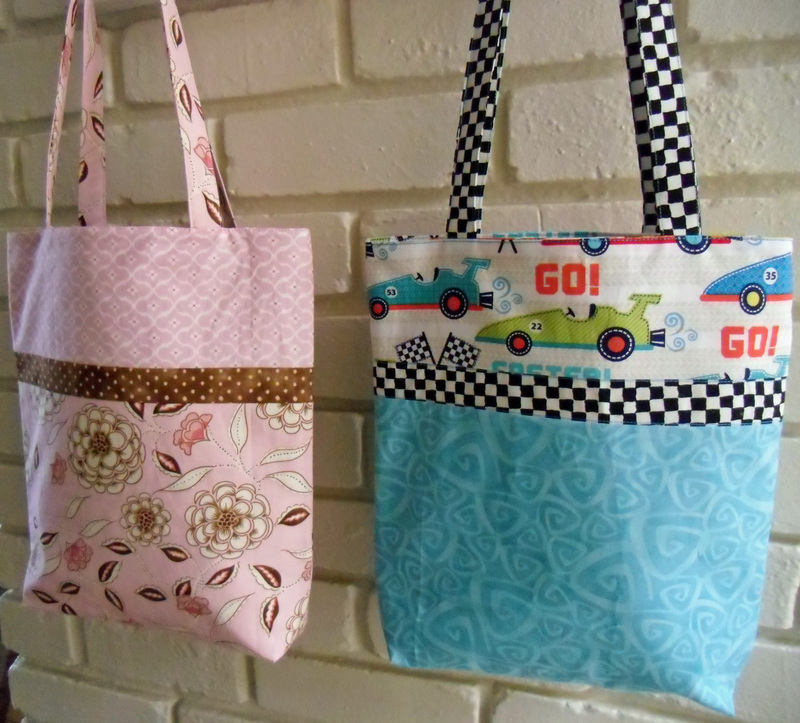 After making the first book bag, I decided a slightly smaller version would be nice for the little ones. You can add as many (or no) pockets to the inside – it’s up to you! 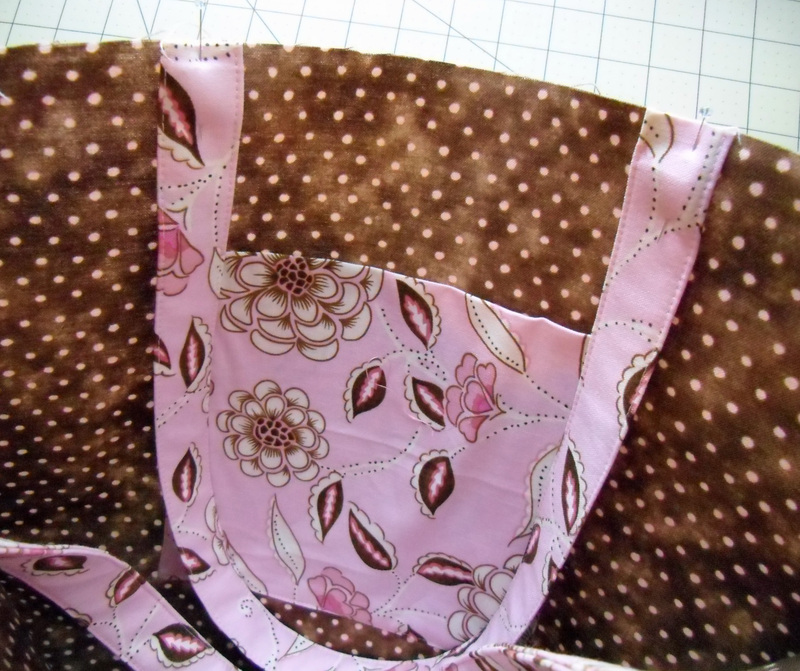 For such a simple bag, I think using a light to medium weight fusible interfacing on the lining is sufficient. I tried a heavier weight (Decor Bond) and it was just a bit too stiff for this project. Step 1: Stitch top band, accent strip, and main body together. Press seam towards accent strip. Step 2: Sew the front and back together. 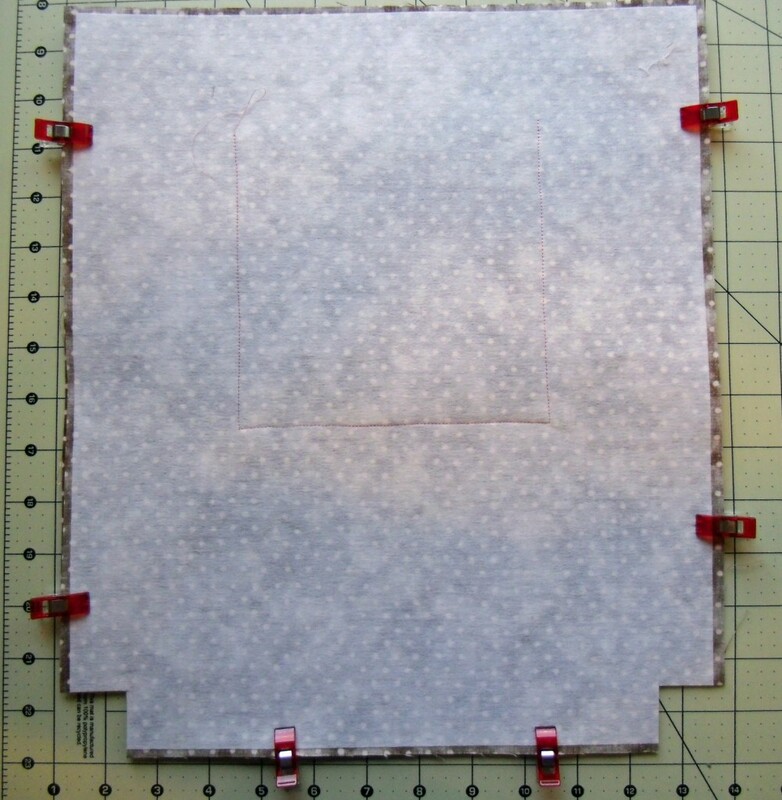 First, cut a 1 1/4″ square out of each bottom corner of bag front and back as shown below. 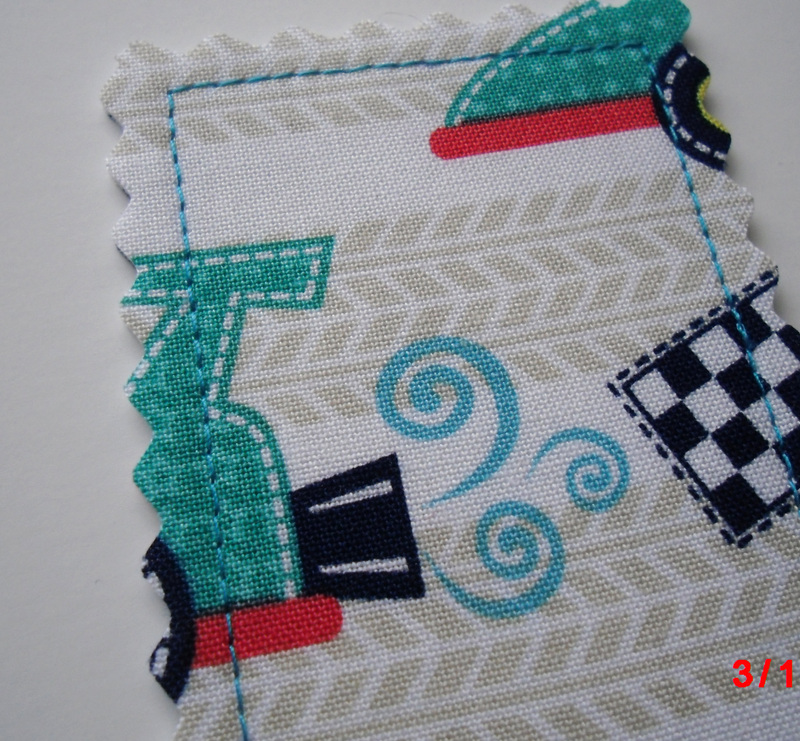 Pin with right sides together, matching sides, accent strip seams, and bottom edges. Stitch. Press seams open. 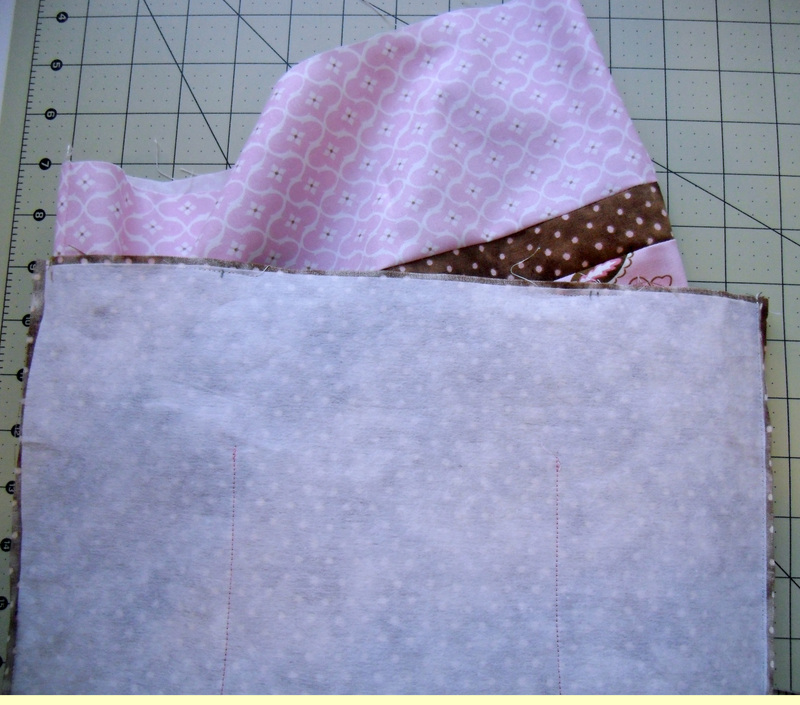 Step 3: Create the boxed corners of the bag by matching the side and bottom seams at corners. Pin and stitch, back stitching at beginning and end. Step 1: Fuse interfacing to wrong side of both lining pieces. Step 2: Make pockets (optional). 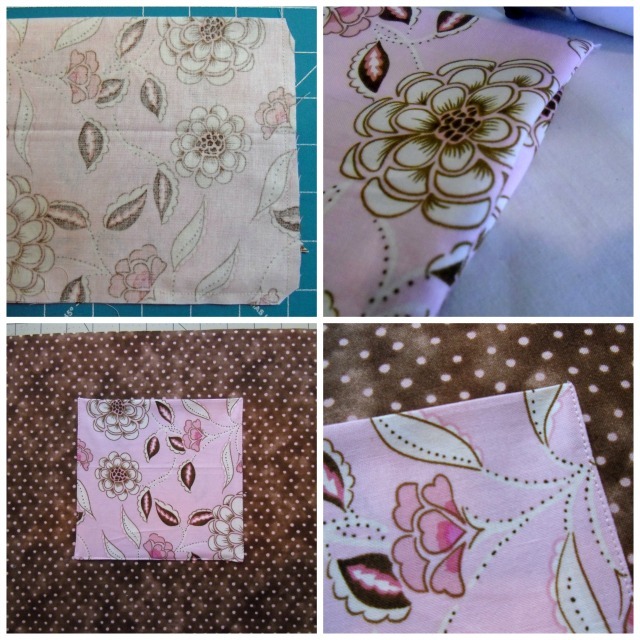 Fold pocket rectangles in half along width, wrong sides together and stitch all sides, leaving a 2″ opening for turning. Clip corners and turn right side out. Press. You don’t need to stitch the opening closed. We’ll take care of that at the same time when we sew it onto the lining. 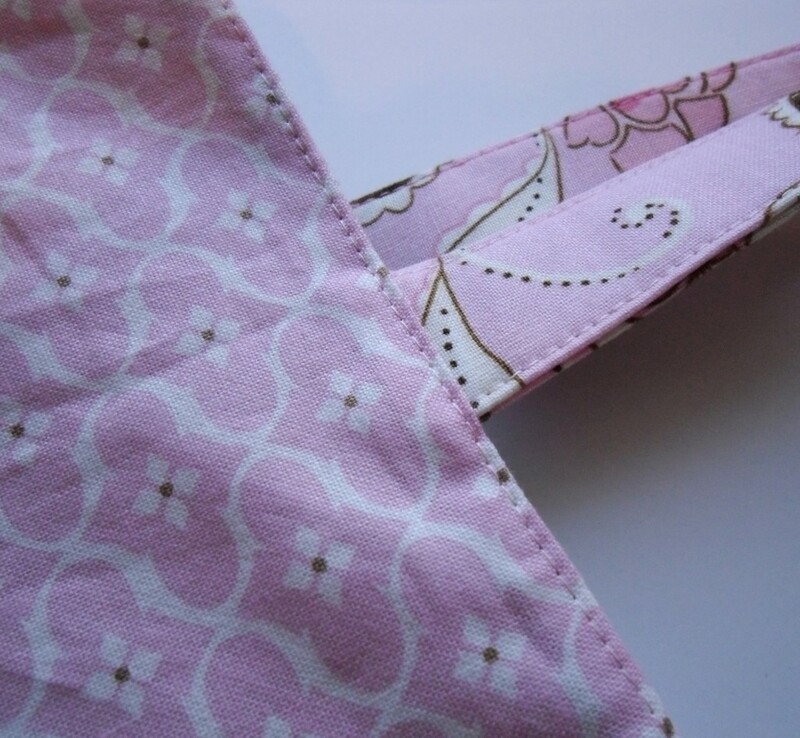 Pin pocket 3″ down from the top and centered on the lining. Stitch in place close to edges, back stitching at beginning and end. 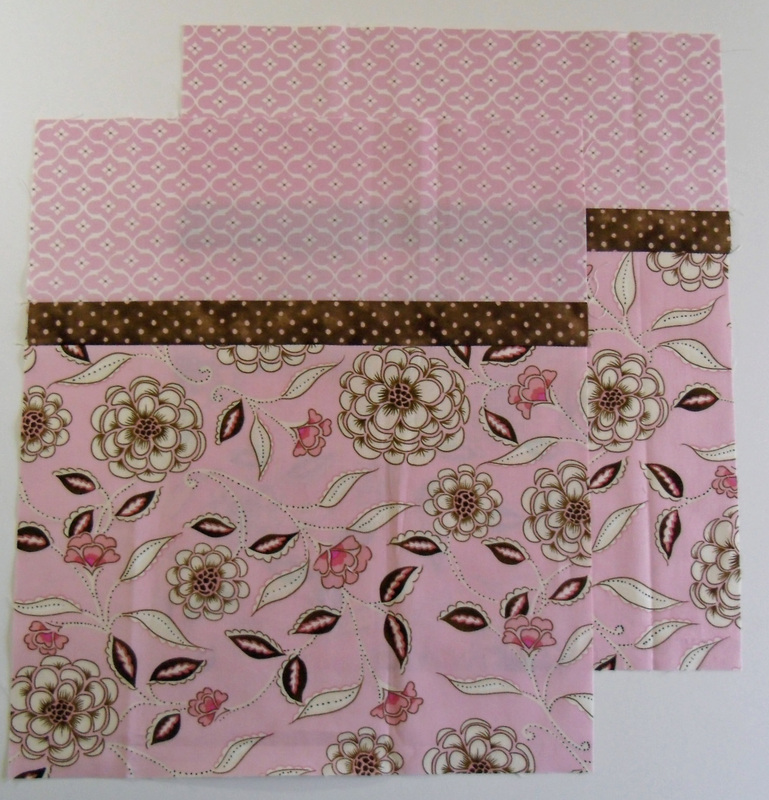 Repeat to make another pocket on the other side of lining if desired. Step 3: Sew the front and back lining pieces together. Follow Step 2 of outer bag assembly, but leave a 3″ wide opening along the bottom edge for turning. Since I used Decor Bond for this bag, it was easier to use clips rather than pins to hold the pieces in place. I love my Clover Wonder Clips! Step 4: Create the boxed corners – follow instructions for outer bag, Step 3. Step 5: Make Straps. I fused some lightweight interfacing to the strap pieces first. It adds extra stability, but it’s not necessary. 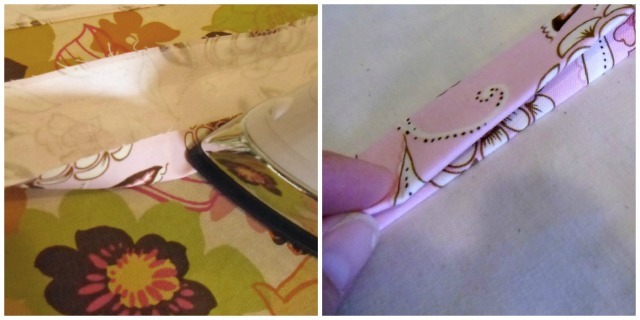 Fold the strap along the length, wrong sides together and press. Fold each long side to the middle crease and press. 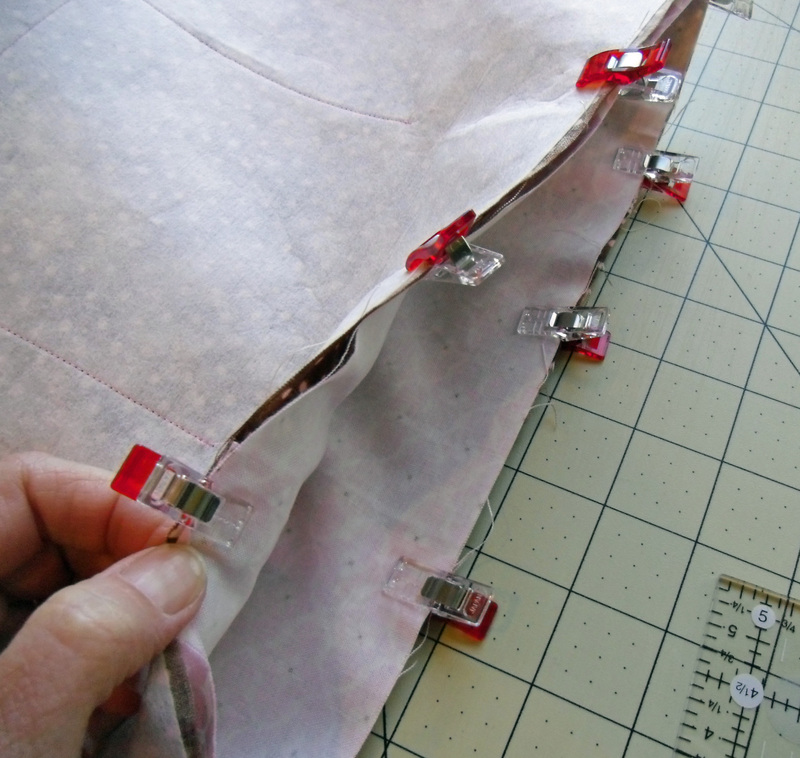 Fold in half again and press, creating a 3/4″ wide strap that is four thicknesses of fabric. 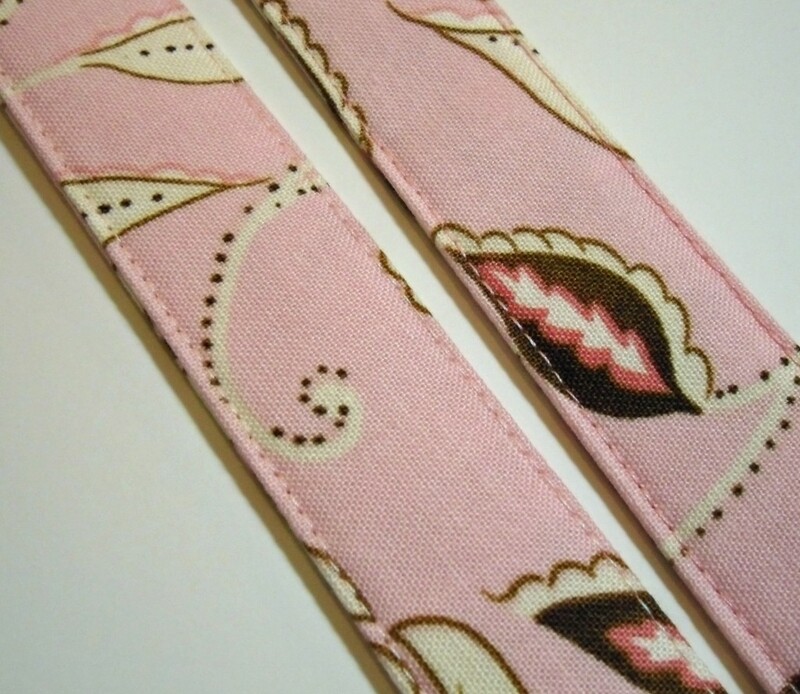 Pin straps to the right side of lining – 3″ in from each side seam. Make sure they aren’t twisted. Baste in place. Step 6: Sew bag lining and bag outside together. 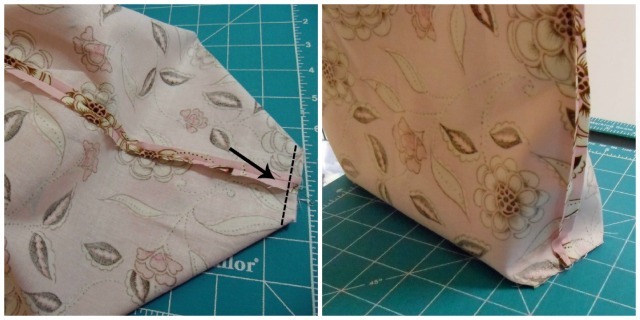 With the outer bag turned right side out, insert it into the bag lining (right sides should be facing each other). Match side seams and pin along the top edge. Again, I used my Clover Wonder Clips. Stitch. Step 7. Turn right side out. Remember the opening we left in the bottom of the lining? Use that to turn your bag right side out. Stitch opening closed. Push lining into the bag and press top edge. Topstitch close to edge. Are you ready for some quick and easy bookmarks? From your bag scraps, cut two rectangles approximately 5 1/2″ x 7″. 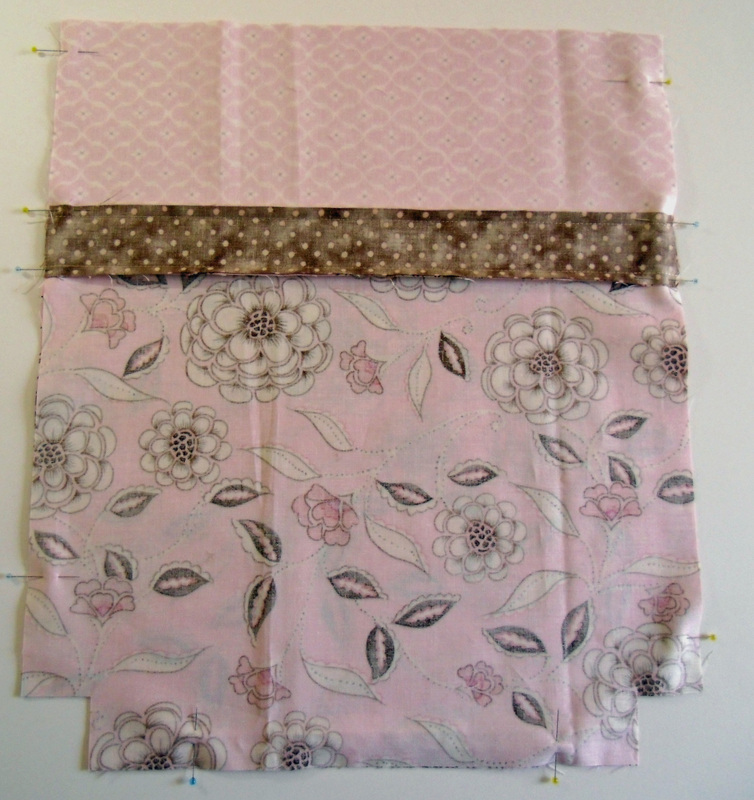 You need a double-sided fusible interfacing or web. Cut it into a 5 1/4″ x 6 3/4″ rectangle. 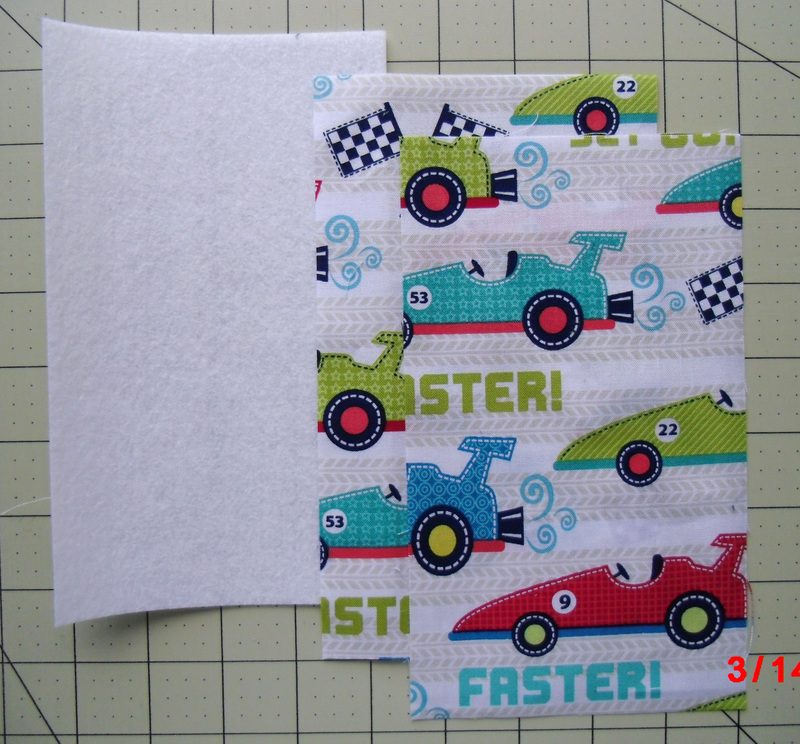 I used Fast2Fuse Interfacing to adhere the two race car rectangles together and give it some stability. It’s pretty thick, so then I tried Heat’nBond Ultra on the pink bookmark and it was a little wimpy but o.k. Either one will work fine. Fuse the interfacing or web between the two rectangles. 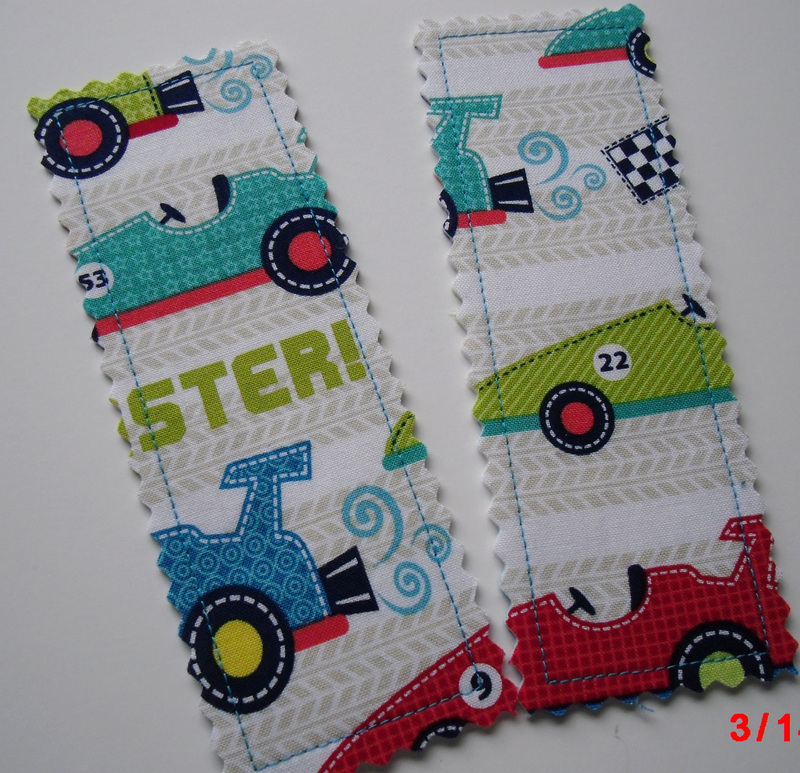 Cut into (2) 2 1/4″ x 6″ bookmarks. I used my pinking blade to cut with so there would be little fraying. Stitch 1/4″ all the way around the edge. Two bookmarks in 10 minutes! 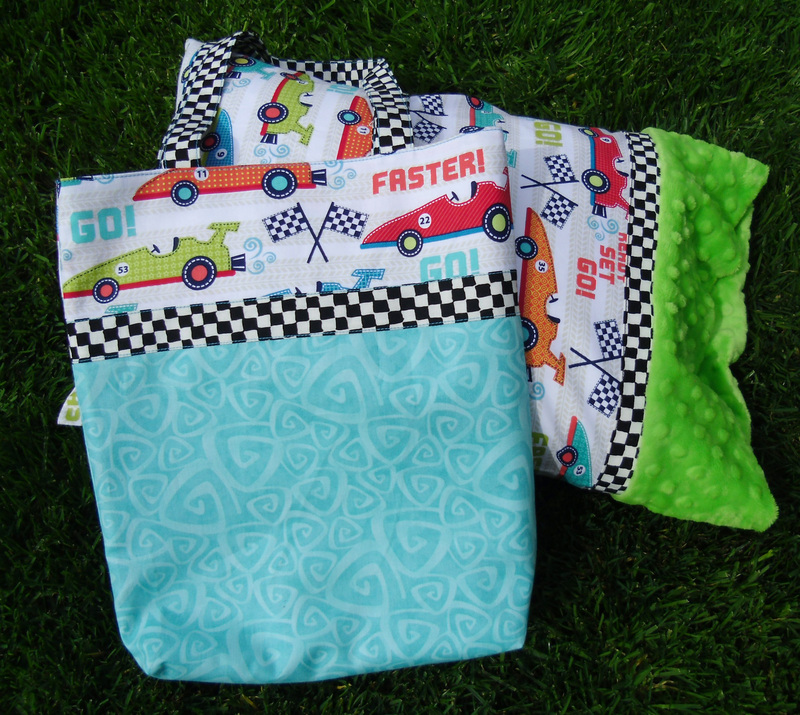 What little guy wouldn’t want to get in the car with his new pillow and book bag? This would make a great gift no matter what season it is! I have six great nephews and I know what they’re getting this year. If you want more Christmas inspiration, stop by Amy Made That! and see what she made for Christmas this month. I just love this pattern and Amy’s version is just right for a holiday table. And she gives some great tips on how she made it. 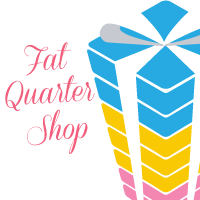 I hope this helps you get your gift-making groove on! I’ve made a few pillowcases in my time using this “hot dog” method, but using minkee and making for travel size pillow in genius. I was especially impressed to see you cautioned being certain a directional fabric is correctly placed. I learned this the hard way! I have watched lots of pillowcase tutorials and never seen anyone mention this very important fact. But, since you are the BEST teacher ever, I should not have been surprised that you pointed it out. Thank you again for taking time to share ideas and methods with us. Thanks so much for the pillowcase tutorial. You are amazing – an inspiration. That is sew adorable! I can’t wait to make one for my little guy. Let me say,your post has been the most explanatory I’ve found. We are making a library bag. Can’t wait to get started! Thank you for your extensive blog post on this project. You’ve educated me & given me the knowledge to complete the project. You did a great job with this!! Wow, you got a lot done! 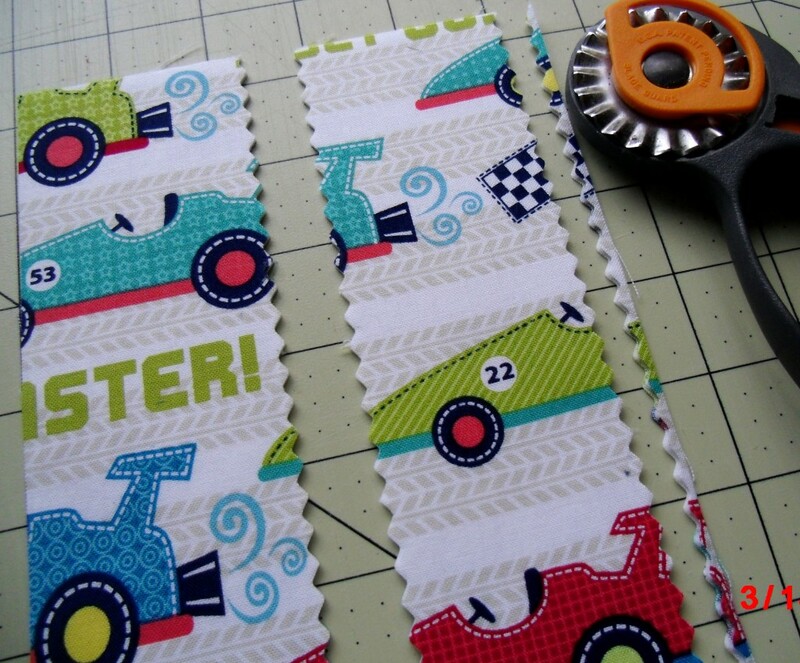 Your projects look wonderful and thanks for the tutorials…I can’t wait to use them! WOW! I think you’ve given me enough ideas to keep me busy for some time! I love the addition of the Minkee for the pillowcases. I have a few smaller piece and this would be perfect for that. 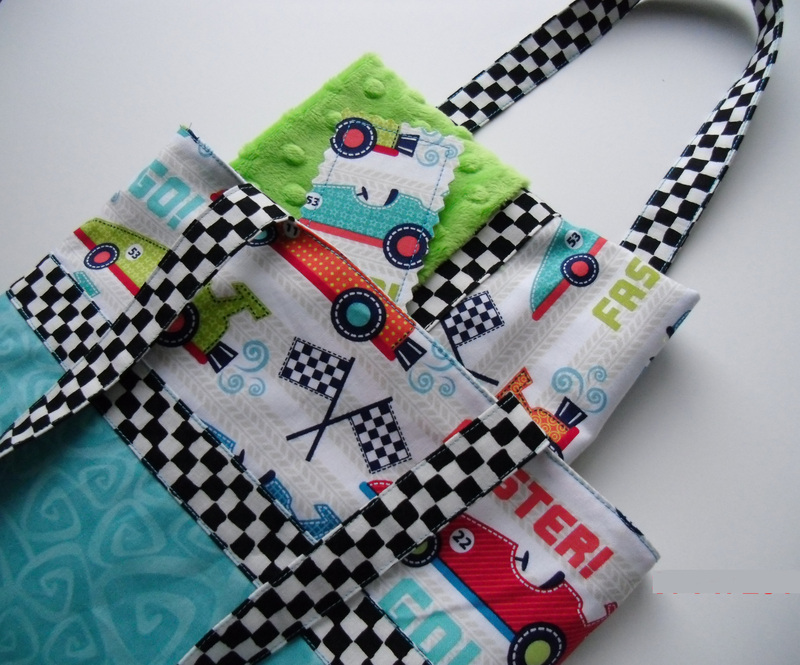 I’ve not made any bags yet, but I have had them on my list and this does look like the perfect one to whip up. 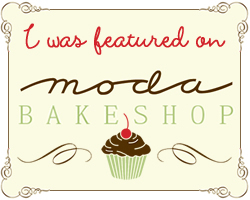 And the bookmark will be a big hit too – books are my favorite non-handmade gift to give. Thank you for so many great ideas! Love your gift sets! I love the idea of using the minky fabrics for the pillows. They look so soft and comfortable. The book bags are wonderful for pretty much anything and I love the bookmarks. 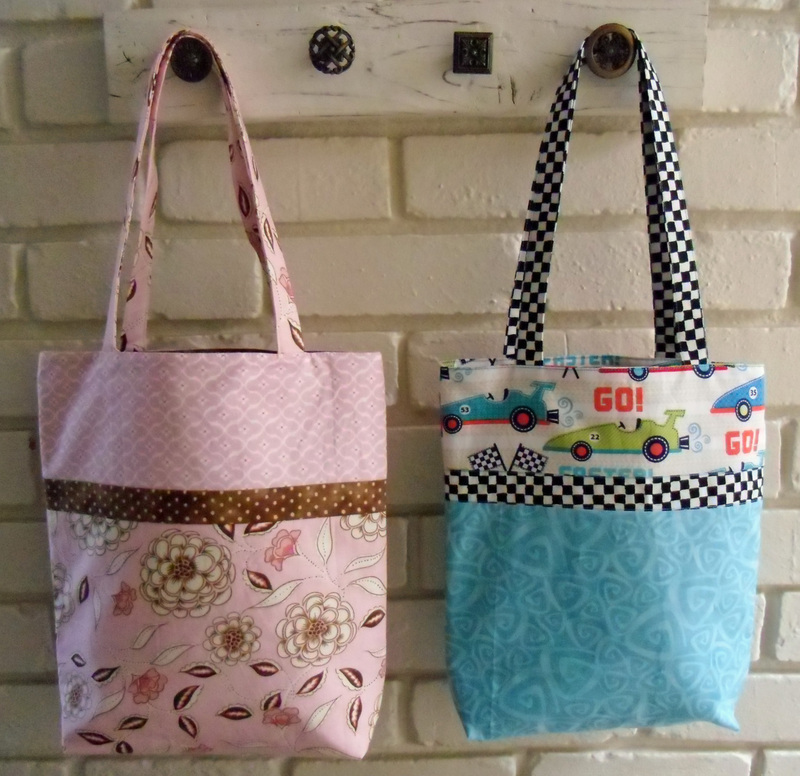 They make great projects for scraps. Wow! What great gifts and the tutorials are amazing. Thank you! I have 3 grandchildren that would love tote bags and travel pillows. What great ideas! 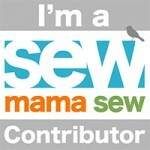 Found your blog via http://sewmanyways.blogspot.com/2013/03/sew-darn-crafty-linky-partyweek-106.html. I’m adding you to my dashboard so I can follow. Thanks for sharing the tutorial. I LOVE these gift ideas!! I feel like my kids always need a bag for something 🙂 I haven’t seen those clips before to use instead of pins. I’ll have to check into that. Thank you so much for taking time to post such a detailed tutorial!! I know my readers would love these ideas, too! We have a weekly link up party at allthingswithpurpose.com and we’d love to have you join us!! 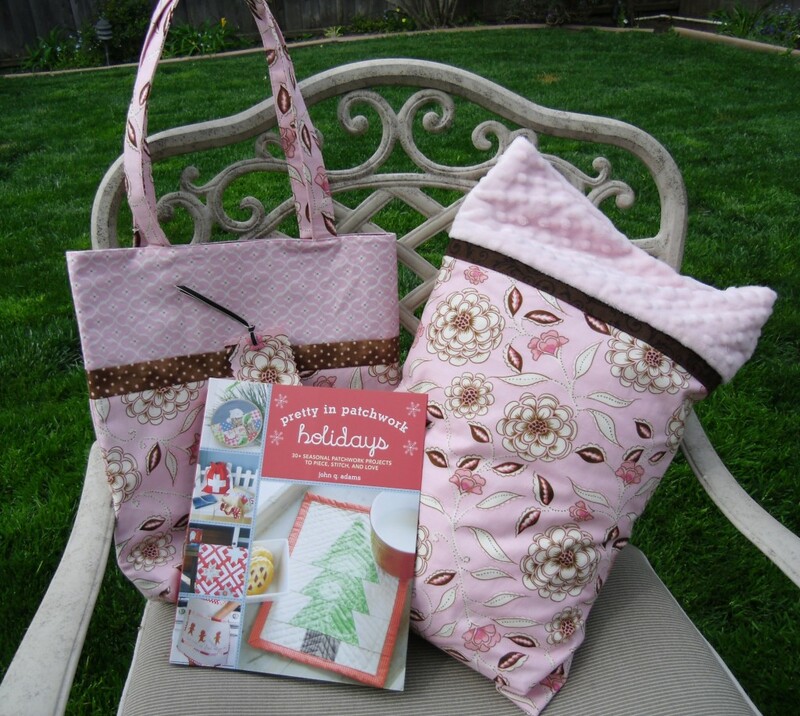 Thanks for sharing your great gift ideas….and great tutorials! 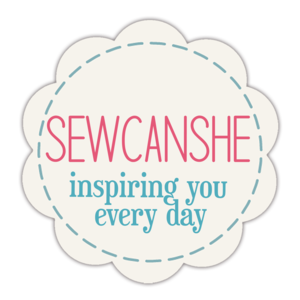 Wonderful gift ideas and great tutorials! Thanks for sharing. What a lovely idea…the travel pillows are great! I think I need to make a few of those for our trips. Thanks for sharing today at Anything Goes and for the great tutorial. Thank you for some great ideas, Julie. 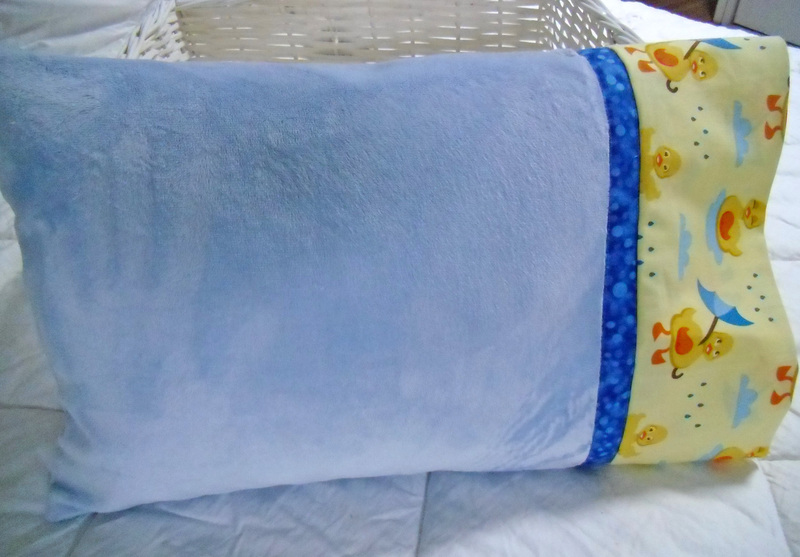 I have yet to do a “CTTY” project this month and I believe the minky pillowcases might be just the answer for the two grandkids. I love this idea! 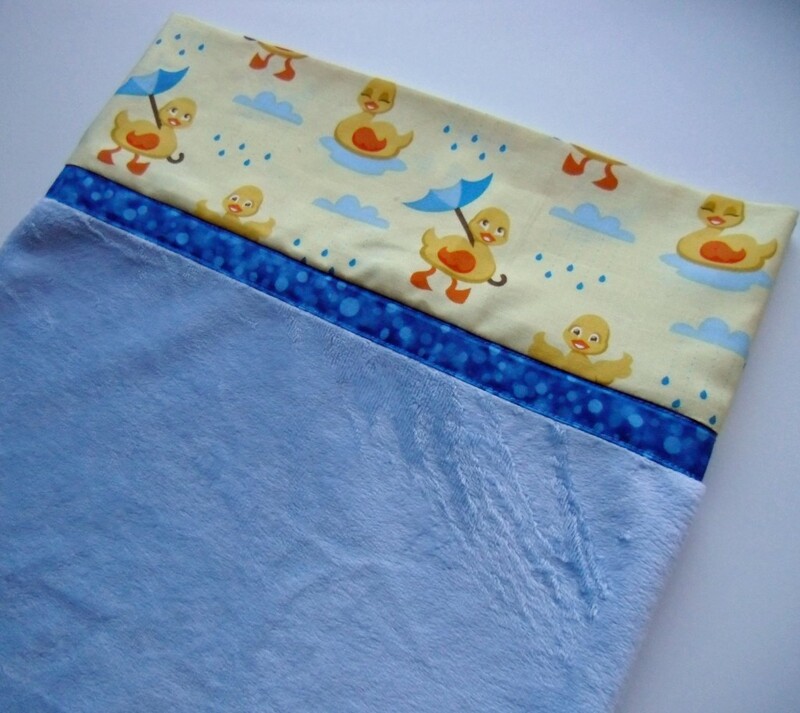 Yes, I’ve made lots of pillowcases but haven’t done one with a minkie. 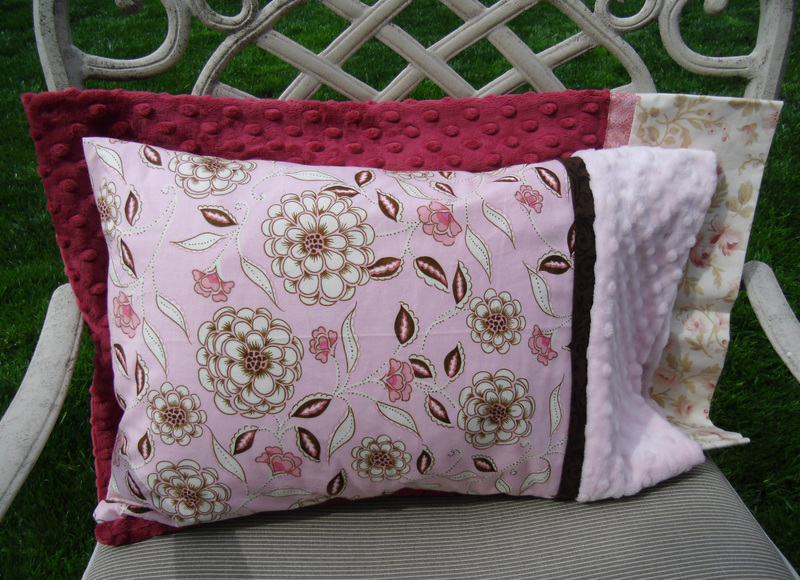 And, what’s funny, this past Christmas I gave them each a minkee lapsize quilt so the minkie pillow will just perfect. Oh my gosh,these look SEW stinkin’ cute!! Thanks so much for the great pics/tips and for the PDF file!! I hope to make some soon. Thank you for such practical, useful, and easy things. Geta is the most talented and famous Roumanian quilter, I pin it her interfacing bag guide, and I also buy her bag patterns. These are both such great gift ideas, for any time of year. I know some sweet little ones that I can make these for! I love the travel pillow case and yes! I will be making a few! I think I will slightly enlarge the book bag to make it a bag that will hold my travel pillow and a small handwork project!